Recently I’ve been noticing what people say when I tell them “Thank you.” Some say, “You’re welcome,” while others use a variety of phrases. 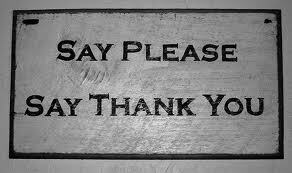 I have to confess that I don’t always say “you’re welcome,” but say “no problem” or “certainly” or something of that ilk. Back in the Pleistocene Era when I was in elementary school, part of the teachers’ purpose was to civilize the urchins in their charge. So, part of the curriculum was devoted to etiquette: how to make proper introductions, correct forms of address, how to answer an adult (I still say “Yes, m’am” and “Yes, sir” to people younger than I am), how to answer the telephone and respond to the caller, and, of course, what to say when someone does something for you. The necessity of saying “Thank you” was drilled into our brains, but I cannot for the life of me remember as similar emphasis on “You’re welcome.” Maybe that’s why I say what I do and don’t use “You’re welcome” consistently. And so, I ask you, does it matter as long as a polite response is made? I feel deficient every time I don’t say “YOu’re welcome,” but no one seems to notice. But then some people don’t say anything in response to “Thank you,” so I suppose what I do is not so bad after all.